A new report published by Transparency Market Research (TMR) on the global array instruments market, titled “Array Instruments Market - Global Industry Analysis, Size, Share, Growth, Trends and Forecast, 2014 - 2020”, is available for sale on the company’s website. The exhaustive report offers a 360-degree overview of the market.According to the research report, the global array instruments market was valued at US$0.87 billion in 2014 and it is expected to reach US$1.12 billion in 2020, growing at a CAGR of 4.3% from 2014 to 2020. 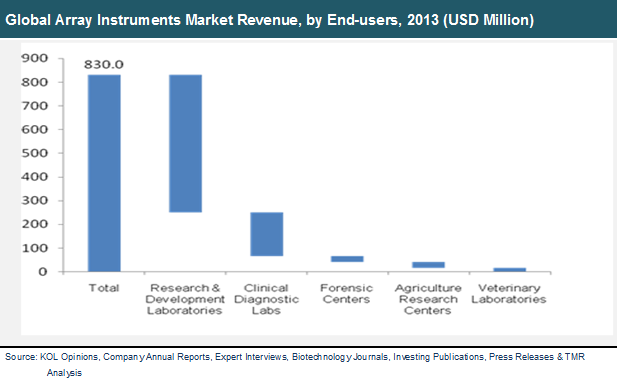 The global array instruments market is segmented on the basis of technology, end users, and geography. The technology segments include protein microarrays, DNA microarrays, tissue microarrays, and cellular microarrays. The end users of array instruments are clinical diagnostic labs, research and development laboratories, veterinary laboratories, agriculture research centers, and forensic centers. Geographically, the global array instruments market is divided into North America, Asia Pacific, Europe, and Rest of the World. The report suggests that the large number of instruments for DNA microarray analysis and their efficiency is likely to be the biggest driving factor for this market. The DNA microarray technology segment held about 50% of the market and it is expected to grow at a CAGR of 3.9% from 2014 to 2020.In terms of geography, North America dominates the global array instruments market with a share of more than 50%, while Europe holds the second place, accounting for 30% of the market. Statistics published in the research report show that the market value of North America was US$417.4 million in 2014 and the market is expected to reach US$526.4 million by 2020. The emerging economies in Latin America, Asia Pacific, and the Middle East are also expected to contribute to the rapid growth of the global array instruments market by 2020. This positive trend will largely be due to improving healthcare infrastructures and increasing preference for more precise therapies. Furthermore, the ability to identify genomic differences for predicting drug response or resistance by patients could lead the industry on a path to customize therapies for certain deadly diseases such as cancer.A recent research showed that glycan arrays are witnessing huge success as they offer a high-throughput approach for defining the interactions between various biological targets and carbohydrates. The biological targets include several antibodies, cells, viruses, and proteins. The biggest advantage of using a glycan array analysis is its multivalent display of arrayed glycans that are almost similar to the actual display of the cell surface. Some of the leading players in the global microarray market profiled in this research report are Affymetrix, Inc., Molecular Devices, Illumina, Inc., and Agilent Technologies, who contribute about 80% of the market’s revenue. The other important players studied in this research report are Thermo Fischer Scientific, Bio-Rad Laboratories, Sigma Aldrich Corporation, and ArrayJet Ltd.